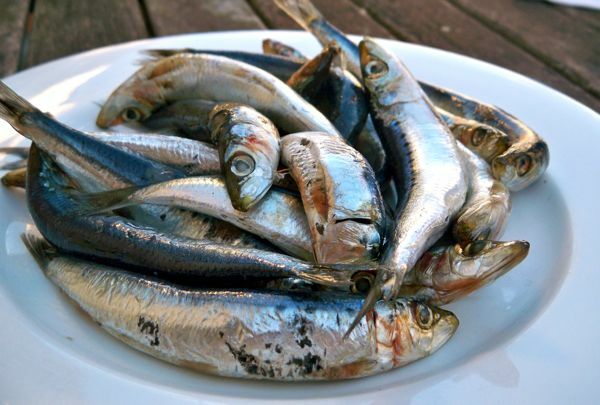 Kris: A sunny afternoon, some fresh local seafood and a couple of friends dropping by? Time for some riesling and perhaps a beer or two. I was keen to make some sushi and discovered a 6 pack of Sapporo at our local bottle shop that, under further investigation on the packaging, was brewed in Adelaide, South Australia. I have tried the Japanese version, the Canadian version in the 500ml can, so how would the Australian interpretation taste? Kris: I have mixed emotions about contract brewing classic beer styles in other countries. It seems common place these days. Guiness brewed in Melbourne. Peroni in Newcastle. Fosters is another prime example. In England it is advertised as Australia’s favourite beer? To be honest, I can’t remember the last time I spotted it in a bar or bottle shop. Apparently the majority of Fosters is brewed in France and sold in England? I guess thats why it is exciting to travel and to sample beers that are brewed in their homeland. 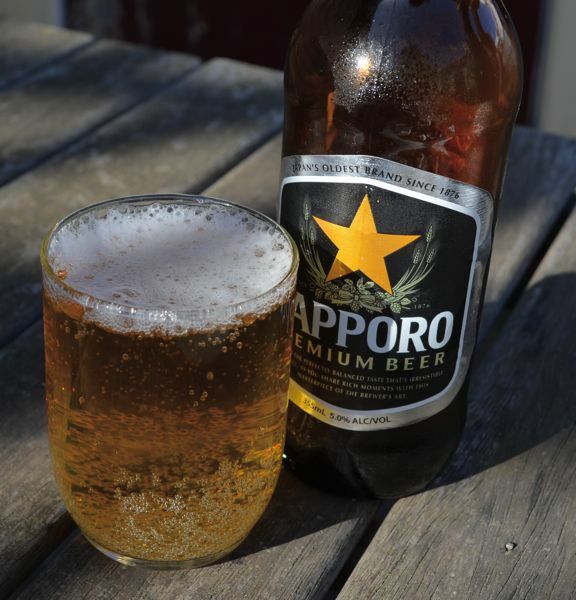 The Australian version of Sapporo was fine. 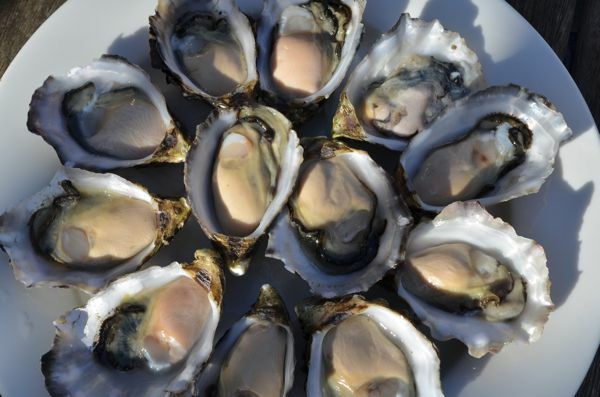 A crisp, easy drinking lager and a good match for fresh shucked oysters and sashimi. I have said it time and time again, I love Riesling! I think it is the hop driven, beer lovers wine. My favourite interpretation of this varietal is aromatic with a distinctive lemon/lime character. 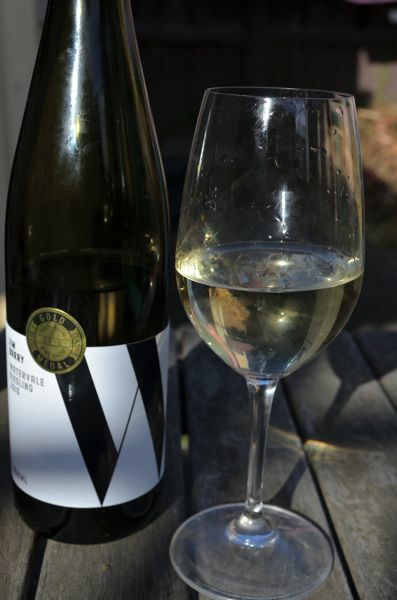 Jim Barry 2010 Watervale Riesling is a classic, affordable version of this style. It is also a great match for oysters and tuna sashimi. 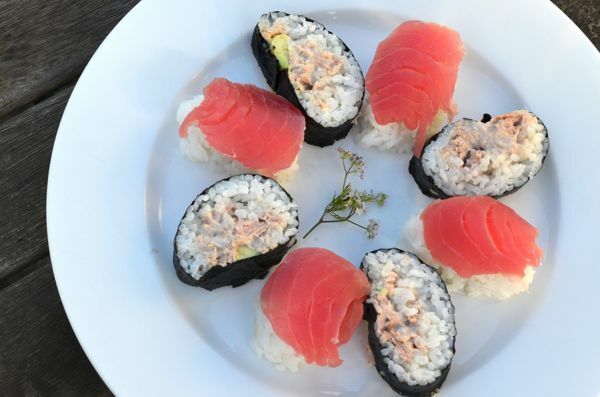 Kris: As mentioned previously, I am still learning the fine art of sashimi/sushi. It is one of my favourite ways of eating fresh seafood. I have the upmost respect for sushi chefs; it is truly an art in itself. 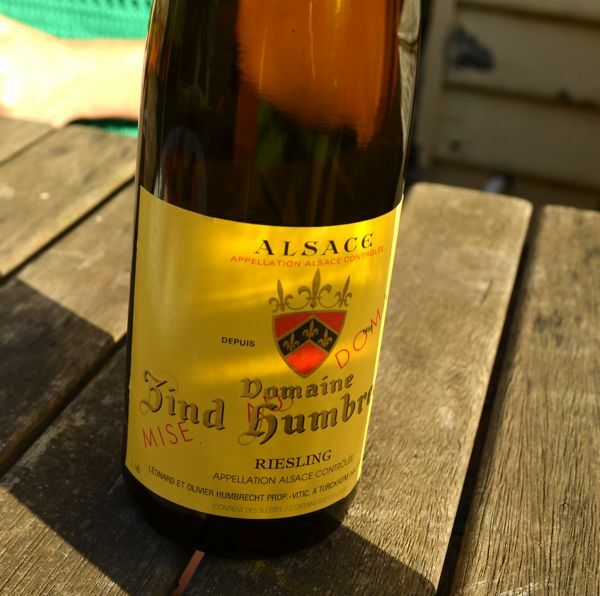 Caroline : I love the Jim Barry 2010 Watervale Riesling; I am also a huge fan of Alsace Riesling and the Domaine Zind Humbrecht was a great match for the oysters and sashimi. It had a bit more sweetness than the first wine we tried and finished with the lemon/lime character that Kris and I both love in Riesling. 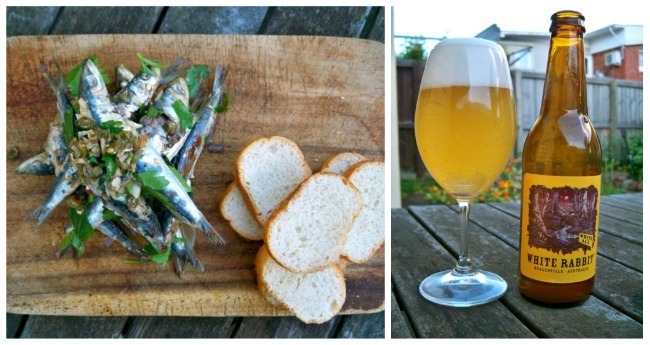 A perfect spring/summer dinner! 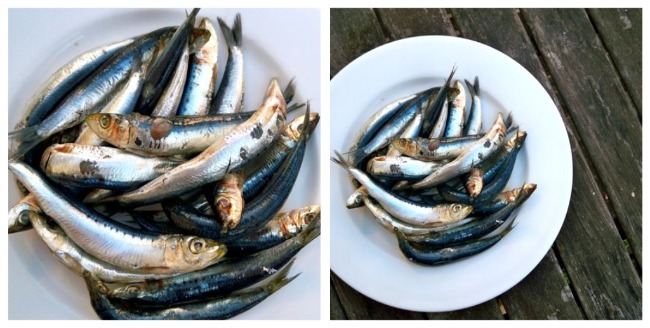 Kris: It was a treat to go to our local seafood shop, MAKO and find fresh sardines. They are easy to use, you don’t need to gut them or fillet them, if you don’t mind, you can eat the whole fish bones and all when cooked. I thought they would be a great lunchtime match with some White Rabbit Brewery White Ale. 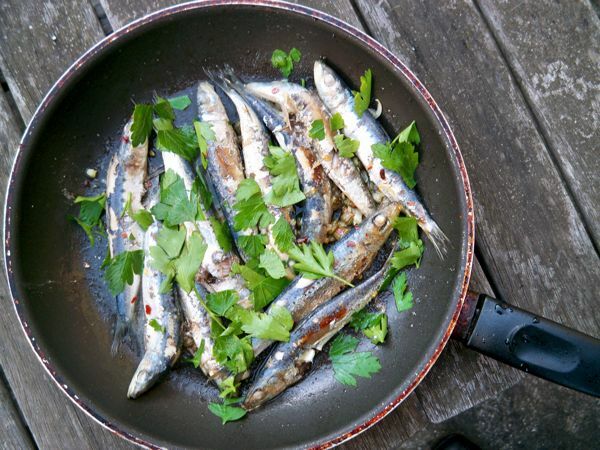 Kris: This simple dish is a perfect match with the White Rabbit White Ale. This is a Belgian style witbier, brewed with juniper, coriander and orange peel. 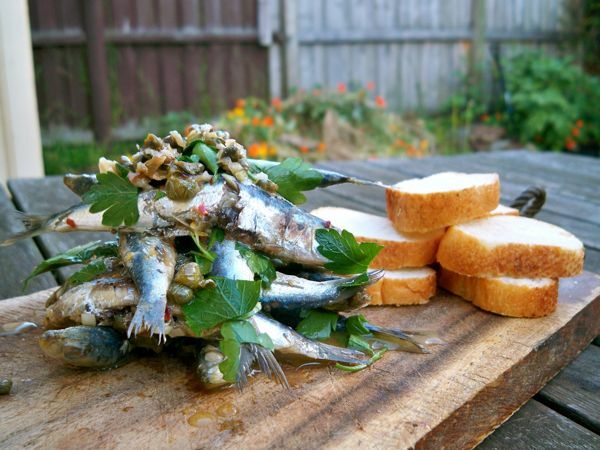 The citrus and spice cuts through the richness of the sardines and the sweetness from the wheat and addition of some local honey balances the intense saltiness of the dish.